By his first wife Mirta Díaz-Balart, whom he married on October 11, 1948, Castro has a son named Fidel Ángel "Fidelito" Castro Díaz-Balart, born on September 1, 1949. Díaz-Balart and Castro were divorced in 1955, and she remarried Emilio Núñez Blanco. After a spell in Madrid, Díaz-Balart reportedly returned to Havana to live with Fidelito and his family. Fidelito grew up in Cuba; for a time, he ran Cuba's atomic-energy commission before being removed from the post by his father. Díaz-Balart's nephews are Republican U.S. Congressmen Lincoln Diaz-Balart and Mario Diaz-Balart, vocal critics of the Castro government. On October 12, 1948, Fidel Castro married Mirtha [Mirta] Diaz Balart de Nunez, a student in the Faculty of Philosophy at Havana University. Castro was then in the last stages of law school; Mirtha was a native of Banes, the daughter of a general, and her brother was to become one of Batista's officers. They were married in a Roman Catholic Church in Orient Province, not far from Castro's birthplace. On their honeymoon in Miami, Florida, Fidel was forced to pawn his watch and other valuables. His financial difficulties were relieved, however, when he obtained money from his family in Cuba. He retrieved his property and prolonged the honeymoon. On the morning of Castro's release from the Isla de Pinos Prison after the amnesty for Moncada, his wife was nowhere to be seen. She later divorced him while he was in exile in Mexico in 1955. Her brother Raphael [Rafael] Diaz Balart; an ardent Batistiano, who was undersecretary to Ramon Hermida, a minister of the interior to Batista. His resignation was forced after the publication of a letter he wrote to Hermida in which he censured him for a talk he had with Castro in the Isla de Pinos Prison. 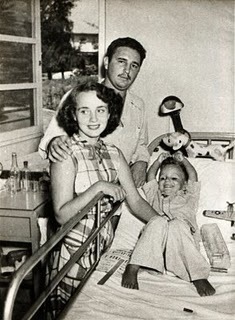 Fidel and Mirtha Castro had one child, a son, Fidel [Fidelito] Castro Jr., who was born September 1, 1949. The picture at the right, (one of the few extant shots of Mirtha) [page 43 PHOTO of Mirtha and Fidelito (photo credit to George Robert Little, Jr. 1956)] shows mother and son embracing during a reunion in Mexico City. Mirtha had claimed the boy had been taken from her by Castro's sister who, in turn, claimed the boy had been kidnaped to bring pressure on Castro to end the revolution. Mirtha denied this and the Mexican authorities dropped their investigation when they were satisfied this was a private not a political matter. The boy is now with Castro in accordance with Cuban law which states that children of divorced parents stay with their father. Mirtha is remarried and living in the United States. Exactly where she is, if she sees her son, whether she has any more children is a mystery to everyone but intimate friends. Castro married Mirta Díaz-Balart on October 10, 1948, and in 1949, Fidel Castro Diaz-Balart, or Fidelito, was born. Castro received a doctorate in law in 1950 and worked for the law firm of Azpiazu, Castro y Rosendo. He also became involved in politics, joining the Party of the Cuban People (Ortodoxos) in 1947.